My family and I spent last week in Galveston, Texas. It was my first time on Galveston Island, and I really enjoyed the trip. We were only there for about three full days, but managed to fit a lot in that time. Today I'm sharing some of the highlights of our trip, including where to stay, eat, and what to do while you're there. There are plenty of hotels along the seawall, but because of frequent hurricanes there aren't any hotels or houses on the beach. We stayed in an AirBnB and I would highly recommend going that route. Our house was only a couple blocks from the beach and it was an easy walk each day. We also had a kitchen and plenty of space for the six of us, which would not have been the case in a hotel. It was all decorated in blue, beachy decor which I appreciated, I wish I had gotten pictures. The Spot : Located along the seawall, The Spot is a fun place to grab dinner or drinks. Made up of five locations in one, there are plenty of choices for everyone. The food was really good, I would recommend trying one of their burgers and my mom loved the shrimp tacos. It's definitely a touristy place, but I enjoyed it. Their variety of bars and cocktails also made it a fun place to order my first drink as a 21 year old. Gaido's : Another restaurant along the seawall, Gaido's is a Galveston institution. Their specialty was more upscale seafood. Our waiter was extremely knowledgable and offered lots of suggestions about the various menu items. I had soft shell crab, which wasn't my favorite because I didn't realize it came fried, but it was good. They also do non-seafood well too, my sister enjoyed their pork chop. Black Pearl : More of a bar, the Black Pearl is a small seafood place in The Strand area of town. Embracing Galveston's Mardi Gras celebrations, Black Pearl offered cajun items in addition to seafood. I had the crab cakes and they were very good, but as a main menu item, I was disappointed that they didn't come with anything in addition to the cakes and still felt hungry after I finished my dinner. The food was good and we liked it, but it's not a must eat in my opinion. Mosquito Cafe : This was by far my favorite place I ate in Galveston. My mom and I went for lunch one day and loved it. The Mosquito Cafe is located in between some of Galveston's beautiful historic homes and they specialize in lunch food, but are open for breakfast and dinner also. It was a busy lunch spot, but the staff were extremely kind and dealt with the chaos very well. My mom and I both tried one of their lunch special that day, I had the southwestern wrap and my mom had fish with fresh mango salsa, and both came with sides. After lunch, we stopped by Mosquito Cafe's sister bakery, Patty Cakes, across the street. Their lemon bombs are delicious, but very sweet. Go to the beach : This is obvious of course, but we enjoyed our time on the Galveston beach. We were on the east end of the island and it was relatively empty during our late morning trips. Pleasure Pier : Galveston's Historic Pleasure Pier is a lot like any pier in any beach town, but we had fun going to it. My younger brother and I got ride all day ride pass, where as the rest of our family just did the regular walk on pass. My brother and I had a great time trying out the different rides along the pier, but be warned they're only a few steps up from your average carnival rides. My favorite was the Texas Sky Flier that went 200 feet up above the pier. I would recommend going to the pier at night when it's cooler and you can't see the ocean below you while you're going on the rides. The Strand : The Strand is Galveston's main shopping area and it's filled with lots of touristy type shops. We spent an afternoon walking around and going into the shops. It's not a must do, in my opinion. But I would recommend stopping into La King's Confectionary for some ice cream, so good! Tree Sculpture Tour : This is a very uniquely Galveston thing. Following Hurricane Ike in 2008, artists came to Galveston and carved beautiful sculptures out of some of the destroyed trees in the city. There's even a map you can get that tells you where to see them. Some are more visible than others, but they're really fun to see. If you're there when it's a little cooler out, you could get out and walk around the neighborhoods, but since it was pretty hot we decided to stay in the car and drive up and down the streets to see the sculptures. House Shop : Instead of window shopping, house shop! There is no shortage of gorgeous old homes in Galveston. My mom and I loved looking at all the colorful houses and picking out our favorite ones. If you want to kill two birds with one stone, a lot of these houses are in the same area as the tree sculptures so you can check both out at the same time! Tour Moody Mansion : The Moody Mansion was once owned by the Moody family, one of the 10 wealthiest families in America. The daughter of Mr. Moody set up a foundation to keep the house running as a museum and it is beautiful! As part of the admission to the house, you are given a small audio device and each room has a recording to listen to that explains the purpose of the room, decor, and even stories from living Moody family members. It reminded me a bit of The Biltmore in Asheville, NC (but smaller) since they were built around the same time. Through the tour we learned a lot about the history of Galveston Island and the Moody family. There is another historic home called the Bishop's Palace in Galveston, but I would recommend the Moody Mansion over it if you only have time for one. My first trip to Galveston was really nice, we managed to fit a lot in a few days, and I would like to go back again some time. 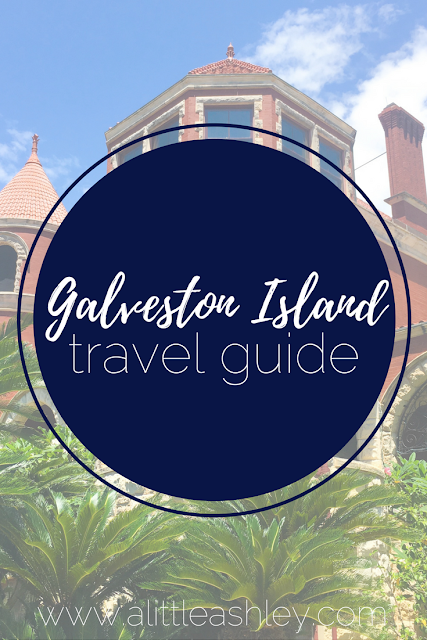 Have you been to Galveston? What did you enjoy doing there?